A secret Facebook site where window cleaners from all over the world are coming together to design the next best thing. www.futureofcleaning.com are an exciting new company that have brought us the Reach-iT Mini and Pro. The whole concept of the Reach-iT product is to have a water fed pole that you will buy for life! 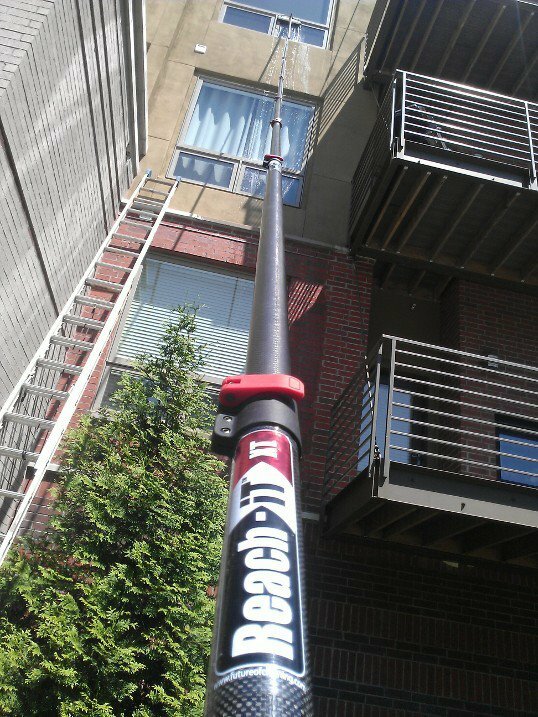 Having bought a 45’ pole for your window cleaning business and it costing you hundreds of pounds, why then, do you need to buy another ‘fixed’ length pole costing further hundreds of pounds in the event you should win that contract demanding a greater height? Futureofcleaning lives by this ethos. Instead of buying a new pole, you simply purchase modular sections at a fraction of the cost. WCM will be doing a review on the Reach-iT Mini and Pro and giving you the close up look on these two new products soon. At WCM, we love innovation and there is no better place to find innovation than a secret Facebook site set up by Futureofcleaning where real window cleaners are coming together to share ideas. We have had an inside look into the exciting new secret world where mindless chitchat is nowhere to be seen. The site is full of window cleaners from all over the planet working like bees in a beehive and coming up with the most exciting innovations and ideas. We will bring this secret ‘Reach-iT design team’ Facebook site to you in an exclusive interview with Perry Taishan and we will tell YOU how you can join this new revolution. We will tell you what happens when WCM puts its own ideas into the pot and we will tell you what the BETA pack is really all about and how this will kick-start the entire experience for you. ONLY AWESOME WINDOW CLEANERS READ WCM! I am fairly new to window cleaning. I have been toying with the idea of purchasing a wfp. Do you need any help with that Brian?… we have some great articles on avoiding ‘spotting’ issues in this Octobers issue…..